After browsing the menu for years, we finally decided to order only one main dish, and one dessert, as we would like to save some space for further culinary adventure. Anyway, the food here is meant to be shared, hence their tagline, “So Much, So Good, So Share”. We learnt this the HARD way at The Curve, ordering 4 dishes for 4 pax, and could not bring ourselves to order desserts then. As I’ve tried their salad, and pasta, I thought ‘Let’s give their pizzas a try!’ They have a variety of pizzas, but the recommended choice (in the menu) is Beef Pepperoni Pizza (RM30.90). Well, pepperoni and cheese can’t go wrong. And it was true. 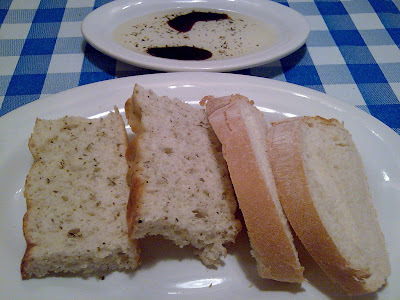 Served on a plate, rather than a pan, it resembles the true nature of REAL Italian pizza, thin, light, and fluffy, and unlike the fast food joint version which contains more flour than fillings. 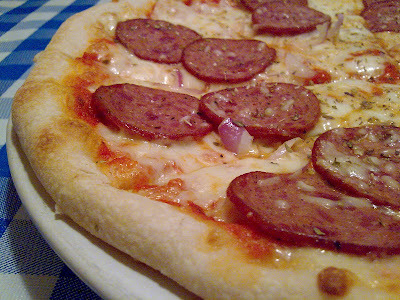 The pepperoni, though a bit salty, is absolutely delicious. Brimming with flavours, matched with the generous amount of mozzarella cheese, and onions, this pizza definitely got the thumbs up from us! Great for beef lovers. Quite filling as well, but we were thankful we did not order another main dish. This way, there is enough vacuum in our little (hehe) stomachs for ….. DESSERTS!! Or rather, dessert, as we were not sure how large the portion is, so we skipped the tiramisu for the time being. But heard that it’s REAL good. 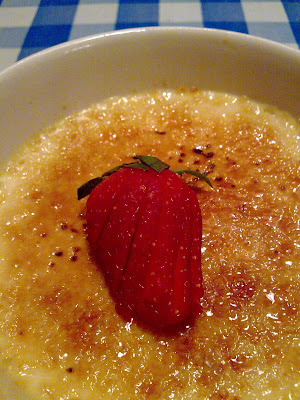 The creme brulee (RM10.90) arrived in a bowl, big enough to be shared among 2 pax. The layer of caramelized sugar is not thick, which is good, and lent a crisp, sweetish zing to the egg custard underneath. The egg was SMOOTH, and very very milky/eggy/nice. 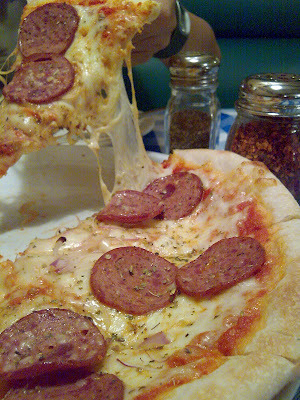 Compared to the version i tried at Italia Mia (an Italian restaurant in Ipoh, which i may blog in the future), which was rather disappointing with the sugar layer burnt, and bitter-ish taste. 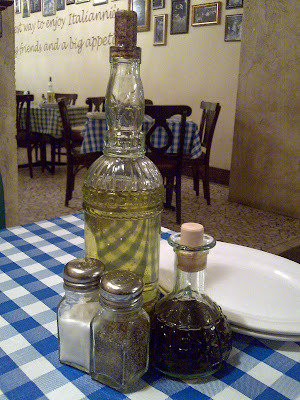 All in all, another satisfying outing at Italiannie’s. If i manage to finish my blog for this 2nd Food Tour, might blog bout the 1st experience at The Curve. Hehe, funny doing things in reverse, huh? This is the place we’ll go whenever there’s celebration for their bottomless drinks aside from Chilli’s and TGI Fridays. yeah, but we asked for plain water only, haha. Cz the 1st time tried their coffee, not so nice la. some more free ma, can order more stuff …hehe, the frugal part of me speaking. oh…u mz try the tiramisu…its the best ever! and also i only, i repeat ONLY ORDER: 1 mushroom soup, 1 caesar’s salad, and 1 tiramisu. tat’s all i have in italiannies. oh … that leaves me salivating now. the tiramisu at SU CHAN also not bad.